Well Hung Highlander with Hat (+ Wig & Beard), Top, Sash, Kilt, Sporran, Socks & Endowment! Fun for Stag Dos & St Andrews! A fantastic seven piece Scottish Well Hung Highlander Costume which includes hat (with attached ginger hair & beard), top with attached sash, kilt, sporran pouch, socks & jumbo endowment – leaving no doubt what’s under you kilt! A comedy costume which is popular for Stag dos, St Andrews day or any fun fancy dress occasion. This is a really detailed and complete costume. The classic tartan kilt has a black elasticated waist for extra sizing flexibility and comfort. The white top has an attached tartan sash to match the kilt. The matching tartan Tam-o’-shanter hat has an attached ginger hair & beard at the front, with space for the face and mouth, and a fun white bobble on top. All of the pictured accessories are also included. The sporran is in a suede effect material with fluffy white design and fastens around the waist with a Velcro tab (which measures 6” for sizing flexibility). The sporran measures approximately 8” X 6” – so is really useful for money, keys and a phone! This costume even comes complete with a pair of white socks, with red bobble detail. Last – but definitely not least – a padded endowment is included which measures an impressive 20” in length. It is attached on a pair of boxer style elasticated pants, with attached balls and hair! This costume is available in Size Medium. See the sizing guide below for sizing details. 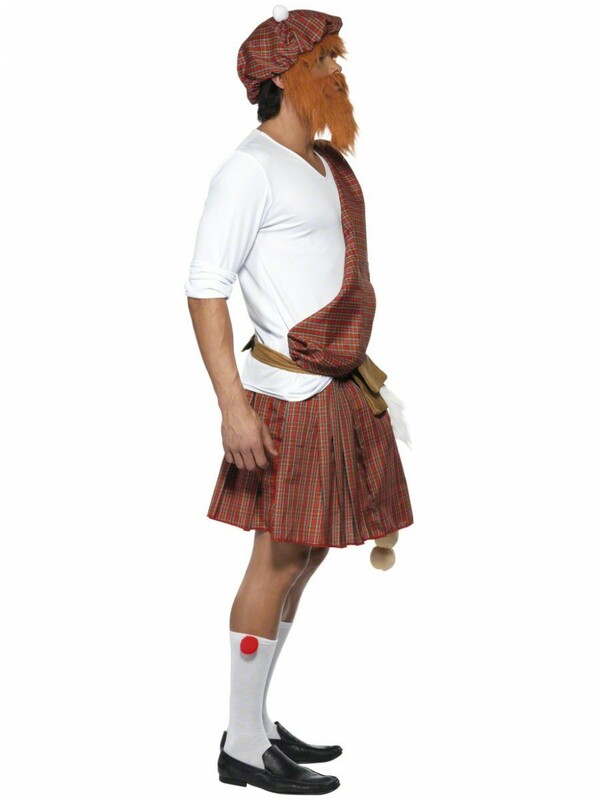 Hat with Hair & Beard, Top with Sash, Kilt, Sporran, Socks & Endowment.